Russian physician; born in St. Petersburg 1851; died there 1899. He graduated from the St. Petersburg Medico-Surgical Academy in 1874 and from 1887 was an adjunct professor there of medical geography and statistics. His main and most important work is his thesis for the doctorate, "Sifilis v Rossii," St. Petersburg, 1885. Among his other numerous works are: "Sanitarnye Poryadki Vostochnoi Voiny," in "Vrach," 1881; "Fizicheskiya Kachestva Russkikh Novobrantzev," in "Trudy Voennosanitarnavo Obshchestva," iii. ; "Ocherki Sanitarnavo Sostoyaniya Yevreistva," sketches on the sanitary conditions of the Jews, in "Voskhod," 1884. 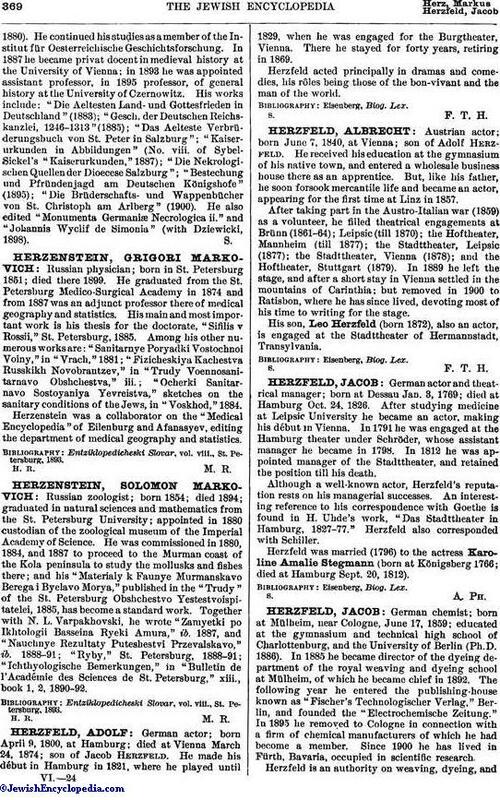 Herzenstein was a collaborator on the "Medical Encyclopedia" of Eilenburg and Afanasyev, editing the department of medical geography and statistics. Entziklopedicheski Slovar, vol. viii., St. Petersburg, 1893.